Upper Deck just released its follow-up to last year's OPC Platinum with this year's iteration of it. Last year's product featured chromed-out cards with rookie autographs alongside parallels of the base set. This product looks to keep the ball rolling with a very similar concept. I wasn't overwhelmed by OPC Platinum last year. Will this year's version change my mind? Let's see. The OPC Platinum base cards take their design straight from the base OPC set released at the very beginning of the hockey season. The only difference with these cards is that they have been dressed with a nice shiny platinum foil coat. Each card is very reflective and looks good. If you're a fan of Bowman or Topps Chrome in baseball, these cards will be right up your alley. I think that they extra shine does the standard OPC cards good and enhances them quite a bit. The cards are, of course, just the foundation for having heaps and heaps of parallels, which I will cover in the Inserts/Game-Used/Autos section of the review. There isn't anything too crazy going on with the back of the card. The backs are simple and give collectors a complete run-down of the player's career. Unfortunately there aren't any write-ups of the individual players - these cards keep it very sparse. One key difference between these backs and the standard OPC ones is that these backs have a glossy feel rather than the cardboard feel. This, of course, makes sense... but I think having a cardboard back on these cards would make for a really cool fusion of modern and retro. Each box promises a Rookie Auto card that is hard-signed. My box contained Jacob de la Rose. These autographed rookie cards have a similar design to the base card except for the top which has a banner with 'Rookie Auto' in it. These rookie autographs are part of the main set rather than the Marquee Rookies from the standard OPC set. I thought this distinction was pretty interesting as the Marquee Rookies are now considered an insert to the main set. It is also important to note that these hard-signed rookie cards are not equal in terms of pull-rate. Though unnumbered, there is a tiered system of rookies that are easier to pull and rookies that are harder. Think Connor McDavid is just as easy to pull as another rookie? Think again, he's of course one of the tougher ones to get. OPC Platinum comes with 20 packs per box. The box states that there is one hard-signed rookie card in it, but it is possible to pull more than just one autograph! My box actually came with another autographed card, though that one was a sticker auto. Still, I'm not complaining about getting an autograph I wasn't expecting. The rest of the box consists of inserts and parallel cards. As I mentioned before, the Marquee Rookies have been given their own insert set numbering. You get quite a few Marquee Rookies per box. Like just about everything in OPC Platinum, there are many, many parallel versions of these cards - all the way down to one-of-one variations. The Marquee Rookie cards look great in foil, and I'm sure many collectors will be on the chase for the parallels of their favorite rookies this season. And speaking of parallels, there are too many to list when it comes to OPC Platinum. Some collectors will probably get overwhelmed by the sheer number of parallels offered in the set. Thankfully, Upper Deck has decided to put the name of the parallel card on the back of the card under the number to help collectors figure out exactly what is it they've got. 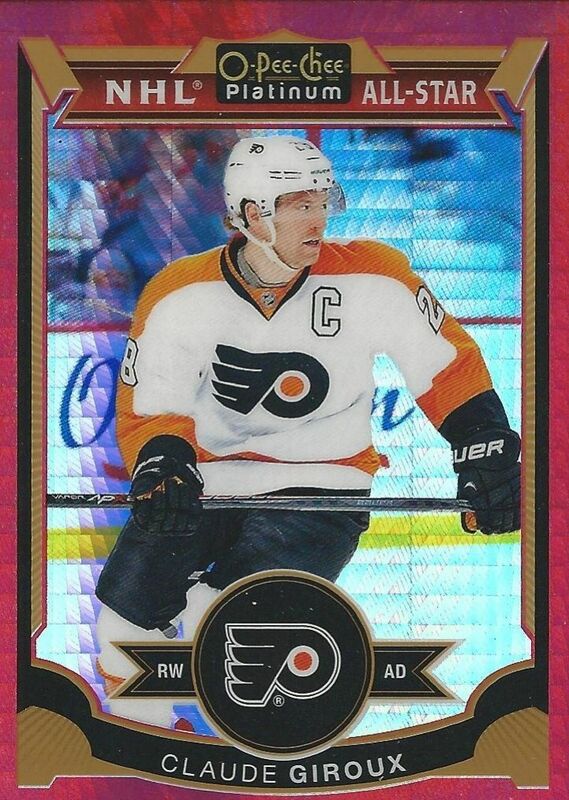 The Claude Giroux parallel shown above is a Red Prism parallel and has serial numbering to 149. Die-cut cards make a return to OPC Platinum this year. I liked the die-cuts from last year and am glad to see them back in this set. They definitely add a bit of variety to OPC Platinum. 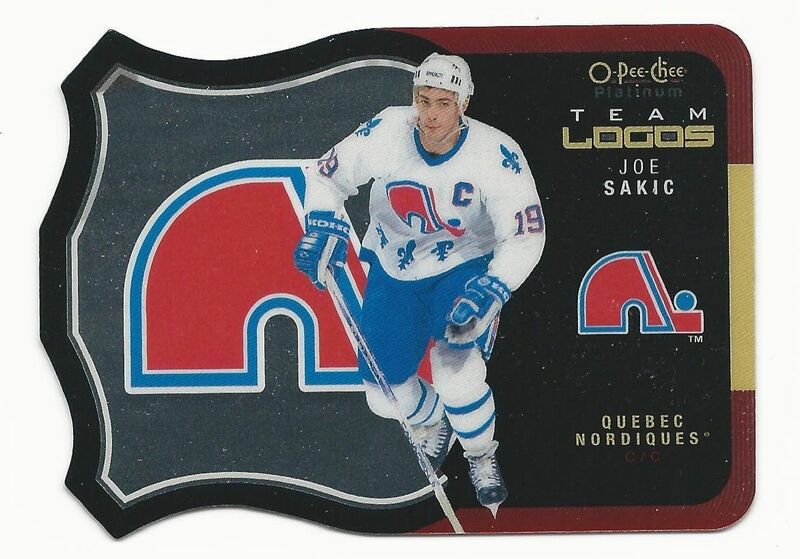 Shown above is a Team Logos card of Joe Sakic. 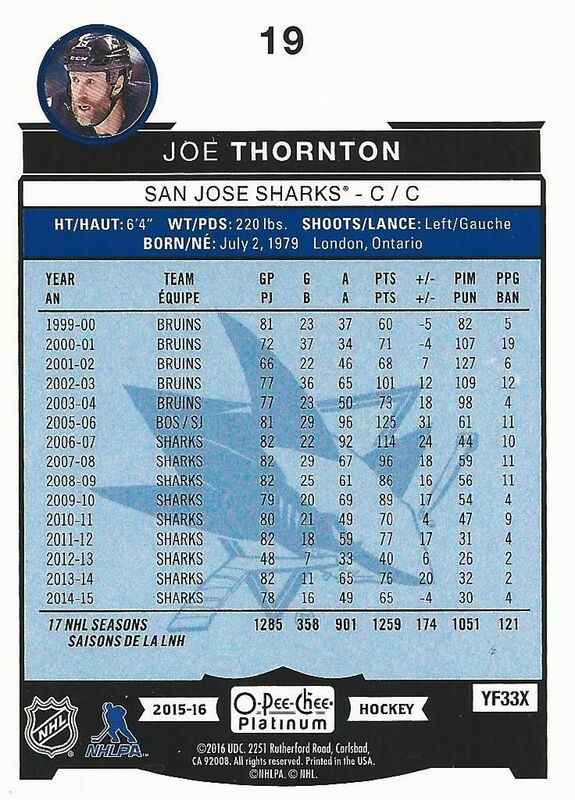 I get a kick out of this card as he is shown in his old Quebec Nordiques sweater. Besides team logo die-cuts, there are also superstar die-cuts and trophy die-cut cards. 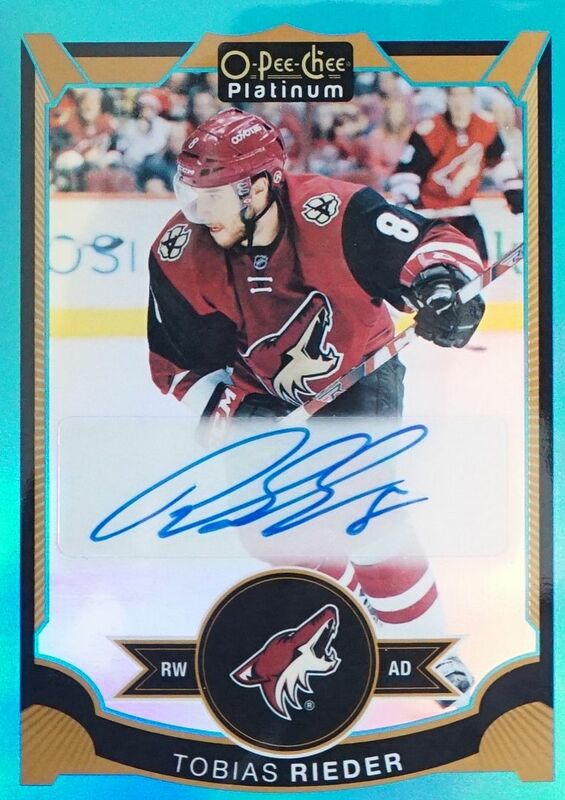 The surprise of my box was definitely this Tobias Rieder Blue Rainbow Autographed card. 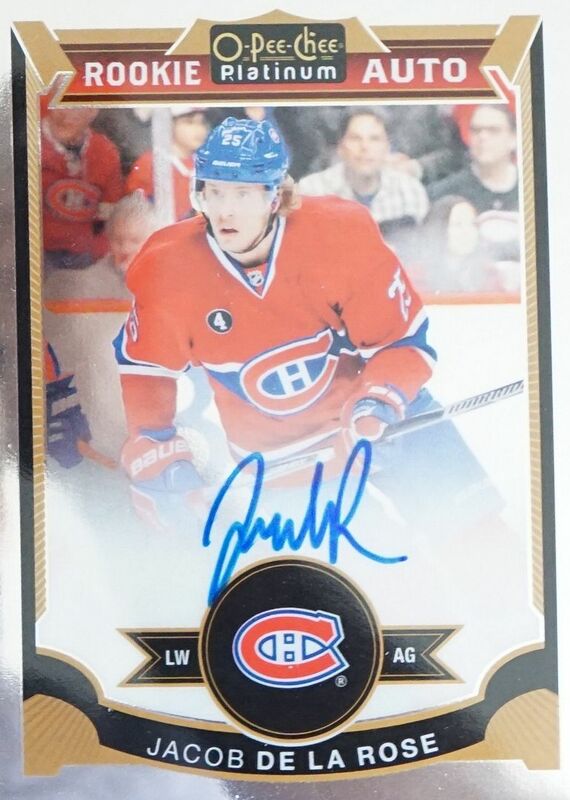 This card features a sticker autograph rather than a hard-signed one. Though it is a sticker, the autograph still looks great on the front of the card. The blue ink and the blue borders work well together. Just like the base autographed rookie cards, these also come in different rarity tiers. Aside from the cards shown above, OPC Platinum has a huge amount of Retro card parallels to find. These cards mirror the ones found in the the standard OPC release. 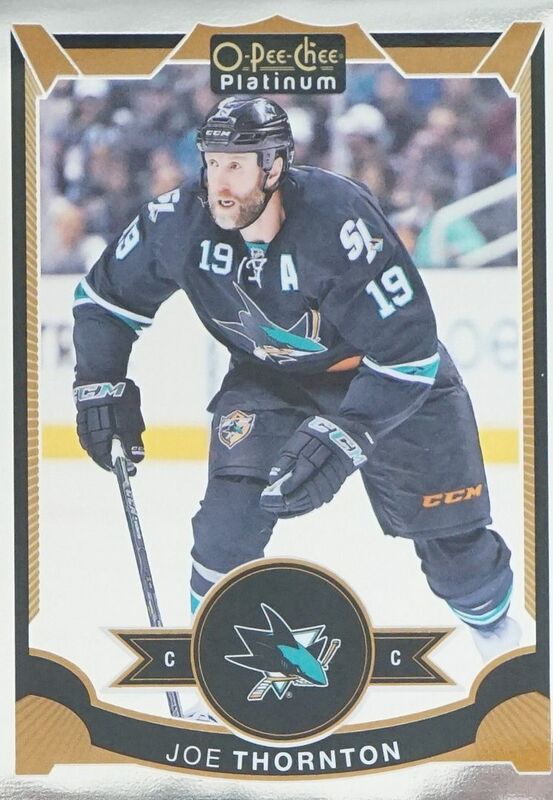 Also, autographed versions of the die-cut cards are out there for collectors to collect. Upper Deck didn't really do much to change OPC Platinum from last year. It actually really feels exactly the same as the previous release. I guess that's good in terms of keeping a product consistent, but I can't help but wish for some more excitement with OPC Platinum. It seems like UD is really going for what Topps has done with their Chrome brands. Topps keeps those cards very basic. It'd be cool if UD went above and beyond what Topps did rather than follow them almost to a tee. OPC Platinum is priced around $80 USD give or take. With that money you are guaranteed just one autographed card. It is a lot for one autograph, but there is also the possibility of getting rare parallel cards as well. To me, OPC Platinum is what it is. Perhaps some collectors will really enjoy it. I personally look for a bit more pizzaz in my releases. OPC Platinum is a solid product based on a tried and true formula, so if you're into it, I'm sure it will satisfy. I think this years opc plat looks the same in terms of base and packaging but the inserts are actually pretty good looking, and the autos while simple, look very good. Great looking cards, seems like an average return. Some of those inserts are nice looking! I like the product, maybe will pick up a box, De La Rose is my PC and rieder is on my hometown team! Really nice product. Definitely one of my favorites over the last couple years! I'm definitely interested in that Rieder if it is for trade. If so please message me on Instagram under he same name! You got some great rookies in the one box! I love the insert cards in this product. Great review! I might have to save up some money and go buy one myself! Great review! I really like this years OPC Platinum and sweet McDavid rookie! Nice review,I think that the opc platinum card look very nice for base cards and I the insert are not.My favorite card is the Connor Mcdavid Marquee Rookie. Nice review! insert are looking good and noce to get at least one autograph per box. Will you be opening the new Rookie Anthology 2015-16 from Panini? Another great review of a newly released product, Luke! Thanks for sharing your thoughts. Congrats on the two autograph hits! Pretty surprised with the box, wasn't expecting so much numbered parallel cards in this one. Great break like always! Great box!! I was really excited when you pulled that extra auto! Great review as always, I just wish us hockey collectors would get more into parallel collecting. It seems like a lot of fun and Upper Deck is doing a pretty good job with them in this product! Great box surprising to pull 2 autos! At 80$ it seems a bit overpriced for the product but it's still a rookie auto. + I like the design of the autograph cards, both the hard-signed rookies that you pulled and the sticker autographs. + The parallells of course do look good in hand. - Too expensive compared to what you are guaranteed. - No exciting news from last year. Great box! Much improved product from last year. great video/review nice de la rose!!!!!!! Nice review! :) I think you got lucky from that box because you got a Mcdavid RC and two autos. I am not too sure. Great video and great review as always. I think the inserts and auto cards look good but the base could be improved on. Great Looking STuff always nice lots of hits nice review! Nice box! Lots of rookies. I wonder if they have a McDavid RC auto in there somewhere. That would be unreal. Looks like a solid box of cards. I think it's a good product to get.. Not too expensive either. Good job on the 2 autos! 2 autos very nice hits. I do like the product and see what ylu mean with consistent, but i do agree that everything is the same. Maybe if OPC was to make the base of the platinum OPC set different from the base of a regular non-platinum OPC set. Just my opinion. But you got a really nice break with 2 autos in a box. This is the 1st break where ive seen two autos. 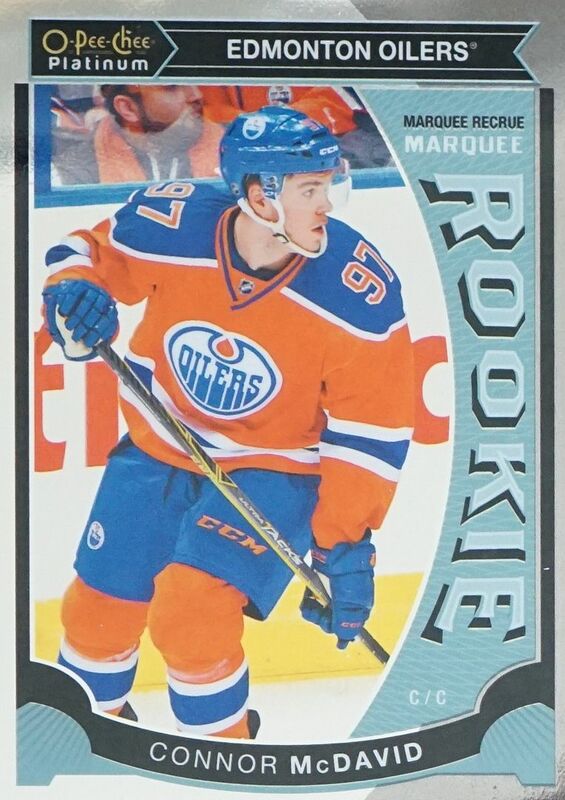 Even though that McDavid card is just a regular rookie card, it is pretty slick looking. Great Style, and another great review! Fair and balanced. I liked it last year and it didn't change ! Great product for that price ! I really like the product again this year. It's great to open some packs and find crazy-looking parallels. Picked up some packs and I will definitely pick some more! Nice break as always! Not a bad product after all. Good review and the base cards and insert looks ok. Getting 2 autos is nice. Reminds me alot of the topps chrome set!